With spring upon us, it is time to inspect the outdoor equipment. For me, that equipment revolves around gardening tools for flower beds, roses, a small garden spot, and this year bird feeders. I now have a beautiful crab-apple tree and two lovely dogwood trees. They deserve a little better than plastic feeders. Drill with a small (1/4 inch or so) metal drilling bit. With the saucer on a flat surface, balance the cup on its side, handle up, to determine the best placement. Notice the areas where the cup and saucer meet. This is where you will apply the adhesive. Tear four strips of painter’s tape. These strips are to hold the cup in place while the adhesive dries. Apply the adhesive where the cup touches the saucer then gently apply the tape to hold the cup in place. Cut the spoon handle from the spoon. Use the drill to create a hole at the top of the handle. This hole will be the point where your chain, wire, or ribbon is placed to hang the feeder. Using the wire cutters or pliers, twist the handle so the decorative side faces the cup opening. After the adhesive is completely dry, usually 24 hours, thread the handle through the cup and pinch closed using the wire cutters or pliers. 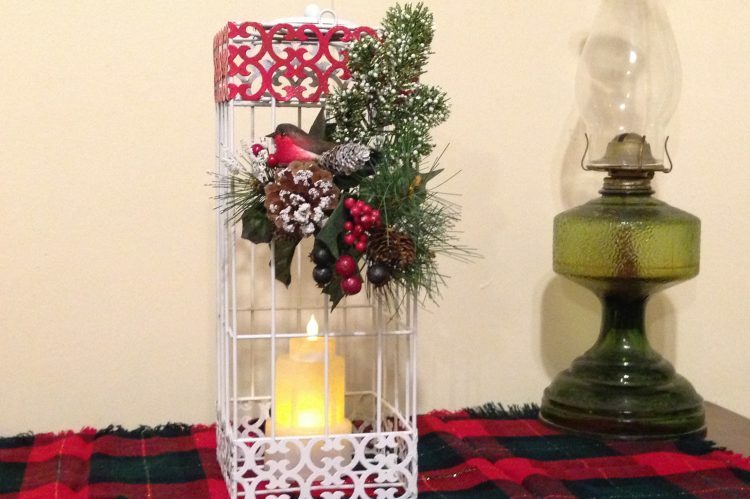 Hang with your length of chain, wire, or ribbon and fill with your choice of bird seed. This is another fun way to upcycle chipped, unmatched, cups and saucers. I have one hanging off my back porch. I put it there last spring and it is still hanging. 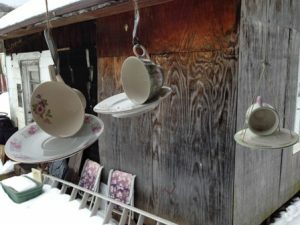 I can’t wait to see how beautiful the trees are in full bloom with these darling feeders dangling from the limbs. Mr. Holstein and I recently purchased a two-story home built in 1922. We are remodeling the kitchen and bathroom, but giving the rest of the house a flavor of its nearly 100 year old history. This gives me an opportunity to create new upcycle projects to share with you. There are several original to the home door hardware with metal or glass doorknobs. Most are covered with paint, but I will be removing it. I hope to share some of the remodeling and refurbishing challenges. If there is a particular project you’d like help with, email me at robinholstein@gmail.com Put “Everyday Upcycle” in the subject line so I don’t delete it by accident.